Experience Elk View, a luxury Colorado private home located at 7550' elevation, in the premier Beaver Creek ski resort of the Vail Valley. This spectacular 7,000 + sq. ft. Colorado mountain home is at the end of a Beaver Creek cul-de-sac. It's the perfect high country setting for a large family, ski vacation, summer golf, or corporate retreat. 7 bedroom or 9 bedroom (with guest home). *9 bedroom has extra nightly charge. See rate details. 7 bedroom has 8 1/2 baths; 9 bedroom has 10 1/2 baths. 7-8 person Beachcomber hot-tub on the 2500 sq. ft. deck beside the third green of the Beaver Creek Golf Course. 3 separate living levels provide quality private spaces. Luxurious master suite with 2-way fireplace, sitting room, personal Finnish sauna, private steam/shower room and deck. Formal and casual dining room seating up to 22. In the case that you would like to have more guests in the home (beyond those staying at the home), this should be requested of the owner for discussion / approval. This is subject to event charges. 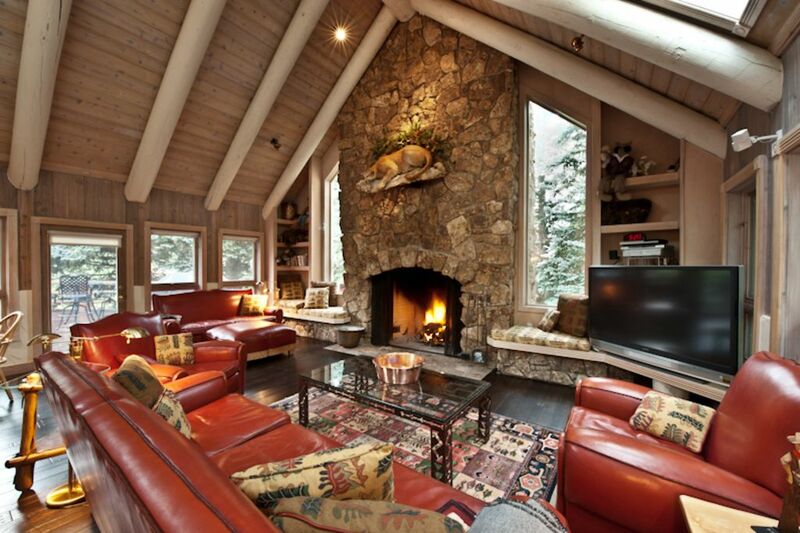 The living room has the largest residential wood-burning fireplace in Vail/Beaver Creek. 8-person Finnish sauna; 6-person white tiled steam room, both with mountain views. Wi-Fi throughout the house and decks. 3 burner Thermal Engineering Corp grill with 45,000 gas jets. 8 1/2 Baths in 7 Bedroom. 10 1/2 Baths in 9 Bedroom (including Guest Home). The Vail Valley is a wonderful experience awaiting your discovery in Colorado. Beautiful scenery, bountiful activities for outdoor enthusiast, and unrivaled dining and boutiques combine to create the ultimate Colorado Rocky Mountain getaway any time of year. Area Attractions include Downhill and Cross Country Skiing, Sledding, Snowmobiling, Hiking,Biking,Rock Climbing, Golf, Tennis, Racquetball, Basketball, Fitness Center, Gym, Fishing, Hunting, Wildlife Viewing, Horseback Riding, Swimming, Rafting, Shopping, Restaurants, Live Theater, Cinemas. Services Offered: Personal complimentary transportation throughout Beaver Creek and Avon (provided by Village Transportation), Pre-Arrival delivery of Rental skis and Groceries/Liquor, Daily housekeeping services.